The trouble is that companies that weren’t in the best position to handle the debt have been among the most aggressive. Late last year, of the 55 billion rupees of incomplete projects, about four-fifths were backed by financially weak companies. This year, of 104 projects awarded under the annuity model, 56 are facing financial closure issues from banks, according to analysts at Nomura Holdings Inc. They noted that companies with weak balance sheets were struggling. The situation doesn’t look like it will improve soon. The cost of capital in India has risen sharply, and bank financing is increasingly restricted. Nervous lenders are looking for guarantees from road builders. Mumbai-listed Dilip Buildcon Ltd., a small company that’s won several HAM contracts, used up its entire working capital last fiscal year. Its debt-to-Ebitda ratio has ticked up alongside, but it boasts margins of 18 percent, the highest in the industry. The company is on the hook for at least six highway projects on the HAM model — that means a significant amount of equity and debt that still needs to be put to work. A commute on the 84-km-long road, which has six lanes, makes an exhilarating experience in the middle of the day as it passes through some of the greenest farmlands between Manesar and Kundli. It goes through Jhajjar, Badli, Bahadurgarh, Sonipat and other parts of the NCR, and connects four major national highways -- NH-1, NH- 2, NH-8 and NH -10. So technically one can go from NH-1 to NH-10 without entering Delhi! It is expected that almost 20% to 25% of non-destined commercial traffic entering Gurugram and Delhi would take this diversion, thus cutting down congestion and pollution levels. Strong votaries of the expressway cite the toll collection figures of Mnaesar-Palwal section as an indication of the future. “Initially, the toll collection on this stretch for first few months was around Rs 20 lakh per day but now the average is around Rs 60 lakh and most of it is from commercial and heavy traffic,” says Pradeep Goyal, vice-president, Essel Infraprojects Ltd, which was awarded contract in 2016. That is @200 crores per year in toll. Additionally it will save the same in terms of diesel/petrol. So over 10 years, it would have paid off the infrastructure cost. Nice 7.2% return per annum. Toll plazas on an expressway? arshyam wrote: Toll plazas on an expressway? Tolls are collected at the exit points. Same case even in Hyderabad ORR. I asked since the graphic specifically says 7 toll 'plazas'. Anyway, as long as it's the Hyderabad ORR model, we are good. arshyam wrote: I asked since the graphic specifically says 7 toll 'plazas'. Anyway, as long as it's the Hyderabad ORR model, we are good. Each toll at various entry points. Hence a car entering Expressway halfway from the side need not have to pay the full toll. They only pays the toll for the distance traveled. It is not a FREEWAY. Just an expressway and tolls can be collected at the exits without impeding the flow of traffic as is done on NJ Turnpike. But the NJ Gardenstate Pkwy used to collect the tolls at exits and also on the expressway itself. So to free the traffic they made collection at smaller number of booths along the way and introduced a system of one way tolls (they collected tolls on one side while the otherside they removed the booths). generally satellite towns, office parks and commercial warehousing and large retail activities(supersized ones like decathlon, ikea) tend to emerge along new expressways here. due to fights with promoter Mr Kheny there is not one single office complex barring Electronic city off the blr NICE expressway which covers a ring of around 40% on western side of bangalore. in any other country, each exit would have a few office parks and thats the case with Hyd ORR also feeding to madhapur financial district and cyberabad. instead densely populated areas with no way to get in and out fast are "IT areas" - HSR layout is mushrooming with small office complexes with almost no parking, koramangala is already gone that route and so has indiranagar. ORR is well ORR...its abilities are worse than some main roads in Noida or Bandra kurla complex. Delhi Metro is the project consultants Namma Metro. It's boss E Sreedharan is a votary of overhead pillar based railway line structure for metro rail projects. The assumption is that it costs more to construct underground. But this reckons without land acquisition costs and more importantly litigation on land acquisition first and then a second round of litigation on compensation for land acquired all of which leads to uncertainty in timeline of completion. Unlike EPE, WPE does not have proper shoulders and looks inferior. WPE is not upto expressway standards. They have cut corners. Thankfully Tendersure project to restart in Bglore. Supratik wrote: Unlike EPE, WPE does not have proper shoulders and looks inferior. WPE is not upto expressway standards. They have cut corners. Saar, with due respects. Did you travel the entire stretch on both WPE and EPE to arrive at the above conclusion? No but you can tell from several youtube videos. WPE, shoulder is good for only motorcyles, will block slow lane if truck stops. Landscaping is incomplete. Finish of road looks ordinary. In contrast EPE which was done by NHAI, I believe, is world std. I think WPE costs much less than EPE. 2000 cr vs 10000 cr. Why so much discrepancy in making the two expressways, which are supposed to be a part of the same project? Do they foresee more traffic on EPE as compared with WPE? Supratik wrote: No but you can tell from several youtube videos. WPE, shoulder is good for only motorcyles, will block slow lane if truck stops. Landscaping is incomplete. Finish of road looks ordinary. In contrast EPE which was done by NHAI, I believe, is world std. WPE is only 90% completed., and going by youtube videos to judge on quality IMO will be misleading at best. Also it seems that WPE was initially conceived as a 4 lane project that was later expanded to 6 lane project. Land acquisition being what it is in desh, probably shoulders were the ones that had to give. ^^ If that was the reason, poor planning I must say...Govts keep compromising and this is the new 'chalta hai' . Expressways world over are built to international standards; even in piss poor nations. And unfortunately for us, its always a hit or miss. 4 lane can work only in rural expressway stretch, surely not in ncr! hanumadu wrote: I think WPE costs much less than EPE. 2000 cr vs 10000 cr. The cost to build WPE 9000 Cr as per HT. There is a difference of 12 years between start of WPE and EPE. The land acquisition cost itself would be lot higher for EPE. Can you post the link to the videos you are referring to? so most likely due to cost, less wide land was purchased in WPE and hence 6 lanes but no much shoulder. ^All assumptions on why ‘the quality is low’ based on actual non-travel but watching some videos! CalvinH wrote: Can you post the link to the videos you are referring to? Saar you sre asking me to post a link I read some 6 days back. Now it is like finding a needle in haystack. Thankfully Kangrez were charging Mudi on politics for throwing open an expressway which was only partially completed! Yes land acquisition cost would be higher for EPE. I remember Gadkari saying its the first project where land acquisition cost exceeded construction cost. The land for WPE was probably acquired long before EPE. So the costs must have been lesser. I got the 2000 cr figure from a youtube video. I was surprised by the figure too. 1) The Western Peripheral Expressway project has been developed at a cost of Rs 6,400 crore out of which Rs 2,788 crore was spent to acquire 3,846 acres of land. this video by a biker guwahati-tezpur-bomdiLa-SeLa-tawang just about sums up the complete lack of investment in border roads unleashed by pre-namo regimes. just see the conditions from tezpur onward. hopefully its much better now. IBNLIVE - we need GQ and EWNS to be made fully expway mashallah. Less than a year after the government announced the new Delhi-Mumbai Expressway corridor, work is all set to begin on the high speed path from March 2019, acording to the National Highway Authority Of India (NHAI). The new expressway will be the longest in the country and will be a signal-free access controlled corridor between the two cities running across five states. The Mumbai-Delhi expressway will cut down the travel time from 25 hours to 12 hours, according to the proposal. NHAI says it has received multiple bids for six stretches in Haryana and Rajasthan for a total of 173 km, which will be awarded to bidders by the end of this month. NHAI will work on another 22 stretches by mid-February, the officials said. “The land acquisition is at the last stage in Haryana. We will be in a position to start work any time between February 15 and March second week,” said an official. NHAI is acquiring about 12,000 hectares for the project. “Now there is a clear line of action. We have fast-tracked the land acquisition process and since the expressway mostly passes through uninhabited areas, getting land is easy. For each package we are getting at least four bidders and all of them are good performing contractors. Since the works are fully funded by government, construction can start soon,” said a highway ministry official. Pace of road construction fastest in four years. We also need the multiple expressways to be linked with each other through interchanges. For instance, the Delhi-Mumbai expressway must link up with KMP and EPE and eventually with Yamuna Expressway (possibly via EPE). On the Mumbai end, there should be link with the MP expressway. Also land acquisition within the cities is a nightmare, what will be the starting and terminating points of the Delhi-Mumbai expressway? I was trying to think in the context of Delhi. For example, the Guragon expressway is one big clusterf***. The entry-exit ramps are virtually non-existent and traffic snarls from Dwarka Mod all the way to Dhaula Kuan are the norm. Now this is supposedly "outside" the "core city", but as anyone who's lived in Delhi can attest, this is an extremely populated stretch and a very important connection between different parts. So assuming that Delhi-Mumbai expressway will indeed start from somewhere near there (Westward bound), have they identified suitable land and how to manage the interchange with the existing expressway? NGT has been impeding many road projects in the area because of environmental concerns and traffic snarls are expected to continue. What good would be a high quality expressway, if getting there in the first place itself will take as long as getting to the other end. Del-Mum expressway is going to start from south Gurgaon. The expressway will be connected from Gurgaon upto Noida by an elevated corridor (details not clear). Del-Mum expressway is actually upto Vadodara as it will connect to Vad-Mum expressway which is already under construction and is part of Mum-Ahm expressway which is already constructed between Vad-Ahm. 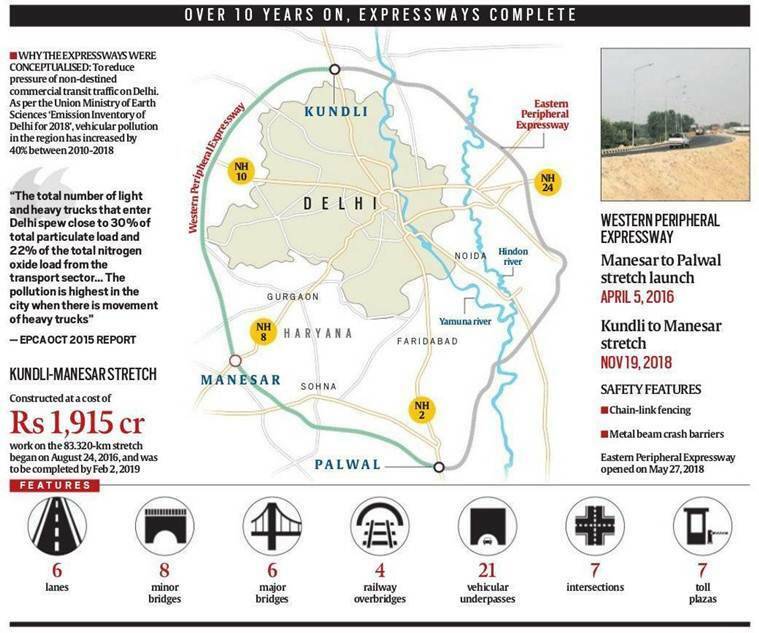 OK here is a report of how Del-Mum expressway is going to be connected to Delhi proper. NEW DELHI: The next phase of highway development in India will focus on building expressways which allow uninterrupted traffic flow. Under the second phase of Bharatmala, the government has proposed to build nearly 3,000 km of expressways, including Varanasi-Ranchi-Kolkata, Indore-Mumbai, Bengaluru-Pune and Chennai-Trichy. The National Highways Authority of India (NHAI), which has been tasked with implementing the flagship highway development programme, has invited bids for undertaking project preparation so that projects are ready as soon as the work for the first phase are bid out. "It took us about two years to prepare detailed project reports (DPRs) for phase one of Bharatmala. Undertaking DPR preparation for the next lot of projects will help save time and the focus is on preparing high quality detailed reports for faster execution," a highway ministry official said. Poor DPRs have been one of the reasons behind delay in execution of highway projects and the government often ends up incorporating supplementary works, which pushes the cost. Barring a couple of identified stretches, all others will have greenfield alignment, which means these will be new roads. This is aimed at reducing distance and travel time as well. The government has notified higher speed limit for cars at a maximum of 120 kmph on expressways. Till now, highway construction has largely seen expansion and widening of existing roads. Some of the identified greenfield highways include Patna-Rourkela, Jhansi-Raipur, Solapur-Belgaum, Bengaluru-Kadappa-Vijayawada, Gorakhpur-Bareilly and Varanasi-Gorakhpur. Considering that forest and wildlife clearances hold up projects for years, the NHAI has asked the consultants to avoid road alignments through national parks and wildlife sanctuaries, "even if it requires taking a longer route/ bypass". Similarly, the consultants have been advised to incorporate provision of separation of local traffic, especially for vulnerable road users (VRUs), for longitudinal movements and crossing facilities through viaduct(s) located at convenient walking distance. Pedestrians, cyclists and motorcyclists fall under the vulnerable road users. A mix of both slow moving and high speed traffic is one of the main reasons of road accidents in the country. good moves. the GOI should completely ban the old non-radial tyres and cheap unsafe chini imports and impose a minimum std of speed rating for radial tires on market. tires bursting at high speed can be fatal on expressways. I am sure the testing for all these speeds was done in cold european conditions long ago. the indian hot conditions will impose its own stress. so whatever starts fading at 180 may happen at 140 @ 45C. better to keep some upside buffer. Mandovi bridge to be inaugurated. I really wish it were a huge suspension bridge. Why our govt. and engineers don't think such projects? Suspension bridges are maintenance intensive and subject to movement during strong and require lots of high quality steel. So? Are we not capable of building and maintaining such bridges? Such infra projects are great showcase materials. They should be build where necessary and where they offer a clear advantage over other kinds of bridges. They shouldn't be build for the sake of building it. We do have quite a few suspension bridges in India don't we? Kashi wrote: They should be build where necessary and where they offer a clear advantage over other kinds of bridges. They shouldn't be build for the sake of building it. We have only cable stayed bridges..Suspension footbridges are there in many locations. Last edited by jpremnath on 27 Jan 2019 15:00, edited 1 time in total.